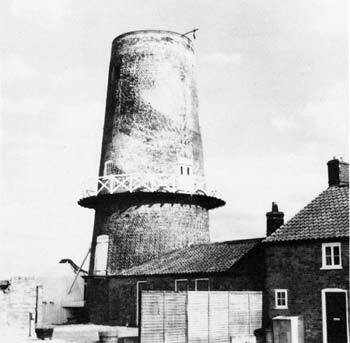 Gt Bircham towermill in Mill Lane was built by George Humphrey in 1846, replacing the postmill that stood on the same site and it is thought that Aickman of Kings Lynn was responsible for the millwrighting work. The five storey mill stands 52 feet high to its curb and bears a datestone inscribed GH 1846 between the first floor windows. A stage was set on the second floor above the section of the mill cottage and bakehouse that adjoined the mill. The tower was 23 feet in diameter at the base with 2 foot thick walls and was originally finished in yellow and red brick that was later tarred. The mill stands on land that once formed part of the Marquess Cholmondeley's Houghton Estate and was bought by H.M. the Queen c.1939. When working, the mill had four double shuttered sails with an overall span of 67 feet that operated at 12 rpm. Each sail had 8 bays of 3 shutters and that drove drove 3 pairs of overdriven French burr stones. The ogee cap holding a gallery and a 6 bladed left handed fan was vertically boarded to form a deep petticoat and was topped by a pointed finial. The iron railed gallery was typical of mills in the Kings Lynn and Wisbech area. A stage was set around the second floor. 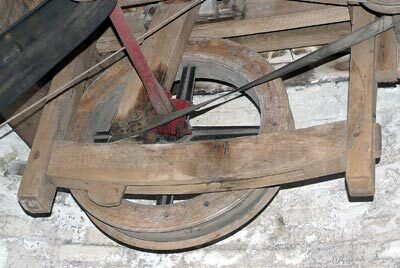 The 9ft diameter great spur wheel was made of cast iron with the rims being cast separately before being bolted on. The wooden brake was operated by a rope from the gallery. The cap was recorded as weighing 8 tons, the windshaft 1 ton and the great spur wheel & upright shaft 3 tons. Brick tower tarred except for top 9 courses under petticoat. Diam. of base outside 25 ft. Walls 2 ft 6 ins. thick. No cap. Left facing west. Remains of gallery. 4 internal ladders vertically above one another. To let, a TOWER WINDMILL with Bake office, Dwelling house, Granary, stables and Outbuildings. Apply to George Humphrey, Great Bircham. 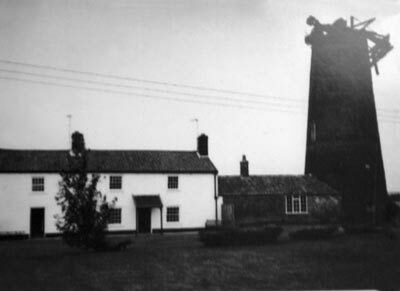 A CAPITAL TOWER MILL driving two pairs of Stones, with BAKE OFFICE, DWELLING HOUSE, Stable and suitable Outbuildings, good Garden and upwards of Two Acres of LAND attached thereto, situate in the parish of Great Bircham, about Fourteen Miles from Lynn and Nine from Fakenham. The property may be inspected and full particulars obtained of Mr. George Humphrey on the Premises, of Mr. Bircham, Solicitor, Fakenham & of Mr. Beck, Auctioneer, Snettisham, Lynn. On 26th March 1864, the Norfolk News reported that whilst drunk and driving his cart home at night with his wife, George Humphrey was involved in a frightful accident and his wife Elizabeth was killed. Soon after this the mortgagees put the mill up for sale and George Humphrey had become bankrupt by the end of that year. Valuable Freehld Land, TOWER WINDMILL, DWELLING HOUSES, COTTAGES, Bake Office etc. Mr. John Beck (by direction of the Mortgagees under a Power of Sale) at the Hare Inn, Docking on Friday May 13, 1864 at 6 o'c in the Evening. Lot 1. In Great Bircham. 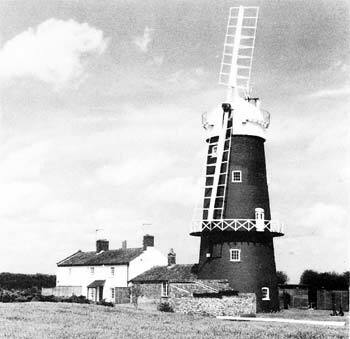 A Capital Brick built TOWER WINDMILL driving two Pairs of Stones with Bake Office, Dwelling House attached, good Garden and about 3 acres of excellent LAND, in the occupation of the Proprietor, Mr. George Humphrey, with two newly erected COTTAGES adjoining the above, let at £8 per annum. The whole of the Property is Freehold. The greater part of the Purchase Money may remain on Security if required. For further particulars apply to Mr. M.B. Bircham, Solicitor, Fakenham or to the Auctioneer, Snettisham, Lynn. Wanted, a good man for the above trades, married preferred. Apply to Mr. W. Palmer, Great Bircham Mill, King's Lynn. WANTED for the above business, a steady respectable man; married preferred. WANTED a situation as above by a steady married man without family. Apply to H.M., Great Bircham Mill, King's Lynn. effects of Mr. Walter Palmer, who is leavinhg the county. Wanted at once, a young man for the above business, single. Apply to T. Howard, Bircham Mill. The above left hand photo shows William Howell driving his bread delivery cart with a friend sitting beside him. The little girls on the road behind the cart are three of William Howard's four daughters, Ethel, Susanna and Dorothy. 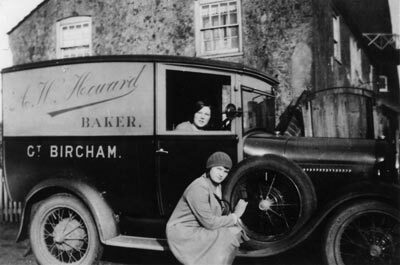 The above right hand photo shows William Howard's van with his initials painted in the wrong order. His daughter May Howard is sitting at the wheel and her sister Ethel is sitting on the running board. The mill tower can be seen in the background. 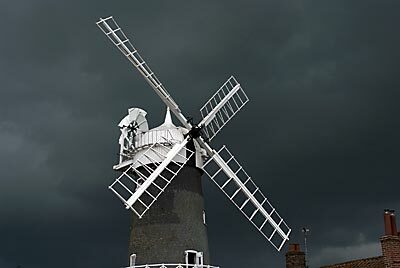 Restoration of the mill began in 1977 and the newly renovated brick tower was then coated with a black resin known as Bellecoat Stipple that was also used on Wicklewood towermill on the Hackford Road. Two pairs of patent 67 foot sails were installed along with a white ogee cap with a gallery and a six bladed fantail. A driveshaft for the sackhoist was brought in from Hackford towermill. Other fittings were brought in including a new iron cog ring for the great spur wheel, two French burr stones and their tuns, a composition sickle dressed stone, an iron stone crane, a boulter, governors and tentering gear, along with an array of mill related exibits for public display. 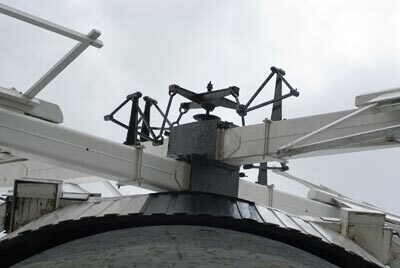 The four patent sails were mounted on two steel stocks that were reinforced with extra welds after the failure of a similar stock at Pakenham towermill in 1983. Lightweight hardboard shutters were fitted and some could be seen stored on the stone floor. A new clasp-arm brake wheel was been built to drive the iron wallower. Second-hand machinery was also installed to replace numerous missing original parts. 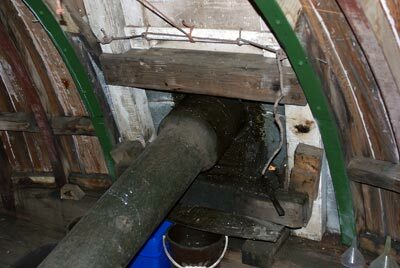 At second floor level one pair of stones was made operable, overdriven by an iron spur wheel and a wooden nut. A forked lever lowered the nut out of mesh. The sails and their operating gear coiuld be reached from a wooden reefing stage at this level. On the meal floor a bolter was installed and the beams and joists testify to former millstone positions. A layshaft driven from an auxiliary bevel ring beneath the spur wheel transmitted power via flat belts to both the bolter and a sack hoist two floors above. A bakehouse attached to the mill was already in use by 1804 and remained in production until the 1950s. The coal-fired peel oven was in regular use after restoration. 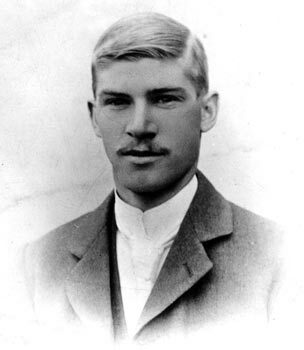 Joseph Wagg was the miller from 1883 to 1888 and was the great-grandfather of the mill’s restorer, Roger Wagg, whose son-in-law Stevie Chalmers later took over the running of the mill business. In July 1985 it was reported that some stones had been brought in including a 4ft French burr stone, marked Corcoran, Mark Lane, London and a large composite stone that was possibly a granulated French burr stone that had been sickle dressed. Tentering gear was also brought in. 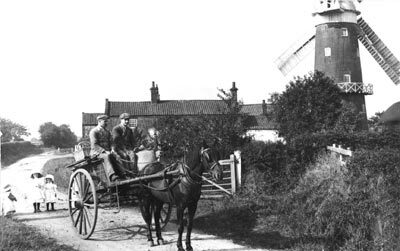 Gt Bircham towermill was opened to the public in the 1980s and soon became a major tourist attraction, selling bread baked on the premises and afternoon teas - see Links page. I still have relatives living in the village, (brother and sister). When I was a boy my Dad Worked for “Billy” Howard and I still remember vividly I was with my Dad working in the field adjacent to the mill harvesting sugar beet when he was called to the mill to help out, I went with him and watched the dough being prepared and the loaves coming out of the oven. On a recent visit to the mill I noticed the big wooden box which held the dough was still there and it looked like the same one. I now live in Kent but I still go home every year. I am also sure I may have a family via Elizabeth Howard née Bales and Bales is the connection as that was my grand mothers maiden name (Mary Ann Bales). Not even the lazy Norfolk wind could turn its sails as it sat in the doldrums waiting for a rotten wooden beam to be replaced. But one of the county's last working windmills will be able to harness its power once more as millwrights put the finishing touches to its towering structure. With a crane to help them, yesterday craftsmen replaced a great oak beam at Bircham Mill in west Norfolk - the missing piece it needs to function. Elly Chalmers has run the mill with her husband Stevie, for 10 years. The pair took it over from her father, Roger Wagg, who bought it in the 1970s. Mrs Chalmers said she remembered her father getting the sails turning again when she was a teenager. “I love the sounds of the cogs turning”, she said. And a generation on, it will be the first time her daughter Rachel, two, will see the sails move. Her brother Alec, six, said he was really excited as he could not remember them turning. Mrs Chalmers said: “For three years we haven't turned the sails because the beam became too rotten. It all rots eventually because it is all made of wood. “We've wanted it done for a long time, but mill wrights are sparse. 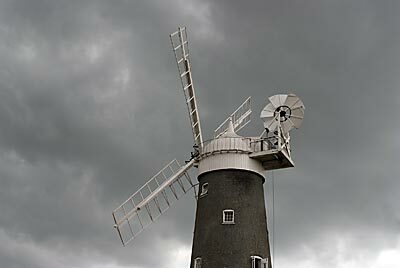 Although her father had planned to grind flour and make bread, Mrs Chalmers said they had decided not to and the fresh bread made a Bircham Mill was baked from flour bought from Docking. “It's not that easy to grind the flour and keep the mill like a museum”, said Mrs Chalmers. 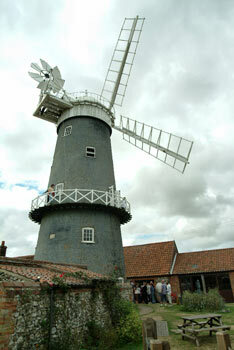 But while flour is not ground, visitors can climb inside the mill and see it working. 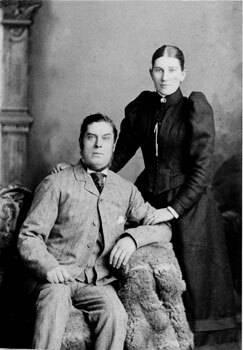 Mr Davies, from Lincolnshire, learned his trade from his father. “In his early days he would have done this with a block and tackle. They would have had to manually drag the beam up with rope and blocks. Mr Davies said it was important to maintain and keep mills running as they were part of the country's industrial heritage. “At one time it was the windmills and watermills that fed the county. When you go back into the early 1800s most villages would have had one. 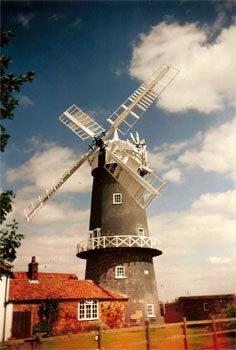 Visitors should be able to see the sails turn again, wind permitting, from Wednesday when the mill reopens. It is open every day from March 31 until the end of September from 10am to 5pm. 2008: Mill open to the public 19th Marct to 30th September, 10.00am to 5.00pm. 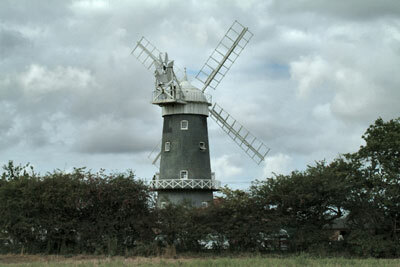 1846: Mill built by George Humphrey, replacing the postmill on the same site. 17th August 1977, Lennard & Lawn removed the cap frame and took it back to Caston mill.